What, you might ask, is a Lustron? After WWII, factories across America were suddenly idle. As were many millions of workers. One man had an idea: why not transform the steel factories which had created tanks and battleships into factories creating housing? Thus, the dream of Carl Strandlund became reality, and Luston built around 3,000 homes between 1948 and 1950, which sold for between $8,500 and $9,500. The houses were all steel: the roofing shingles, exterior wall cladding, interior walls and ceilings, and even the numerous built-in cabinets. All the steel had an enameled finish, and no homes ever built were so easy to clean. I have loved Luston’s for decades, and was thrilled to finally be IN one at the Lustron House Museum in Great Bend, Kansas. Whoee! Great Bend has a remarkable eighteen Lustrons! Zounds! 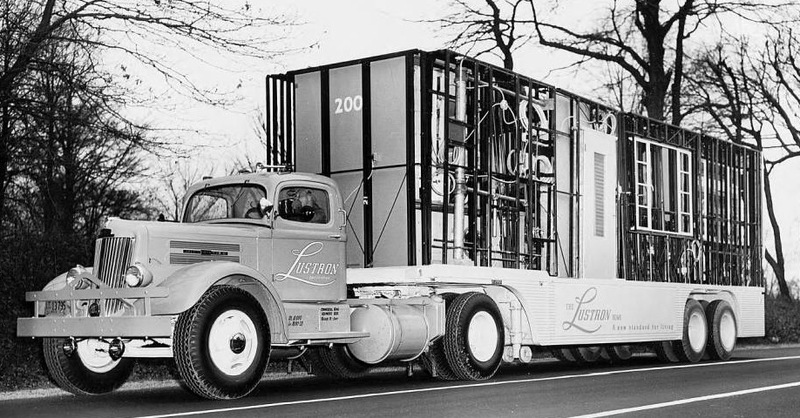 ABOVE: If you ordered a Lustron, it arrived on a huge trailer. 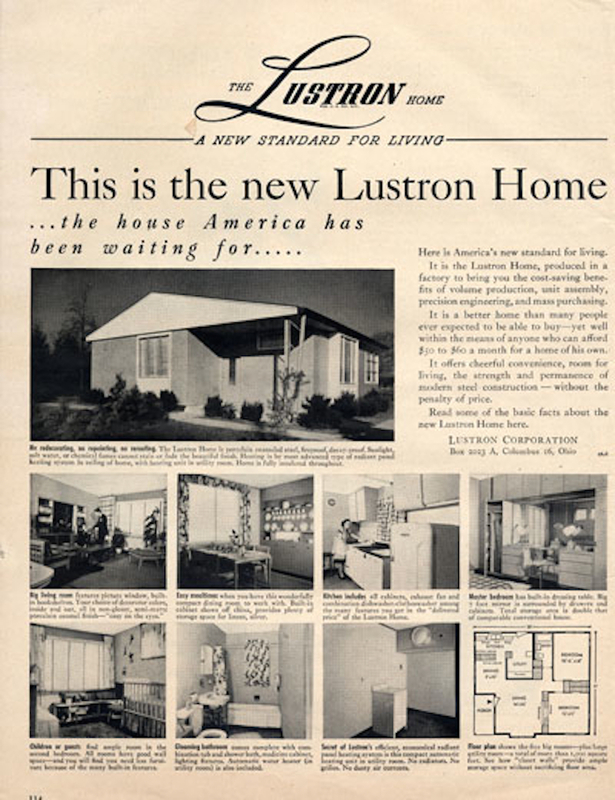 ABOVE: Lustron built demonstration homes which proved wildly popular. 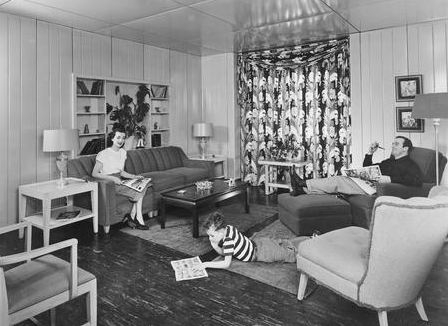 ABOVE: The all-steel interiors were softened by rugs, upholstered furnishings, and curtains. 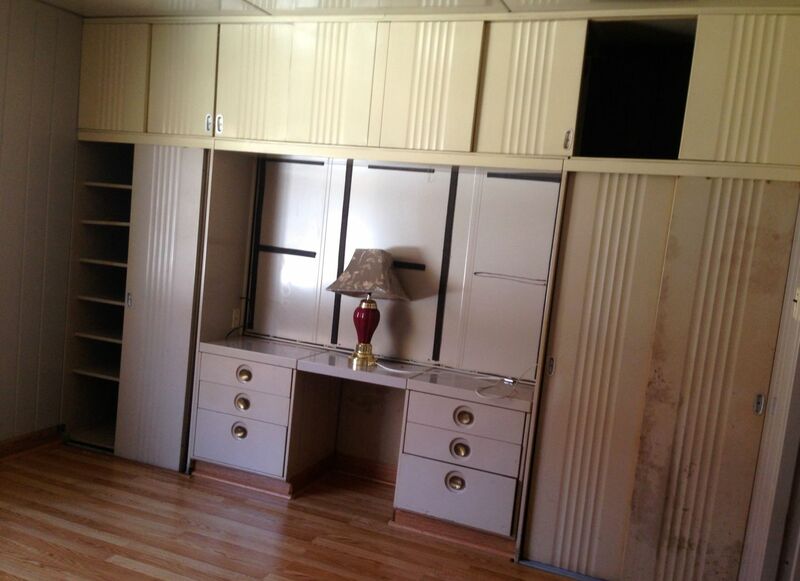 ABOVE: I would love to see a Lustron restored to this look. Note how the woman seems to be having a delightful conversation with one of the table lamps. People who buy and restore Lustrons often create an Atomic-Age decor, or Art Deco-inspired. But Lustrons were created between these two eras, and they have their own distinct period aesthetic, as exemplified by the two images above. 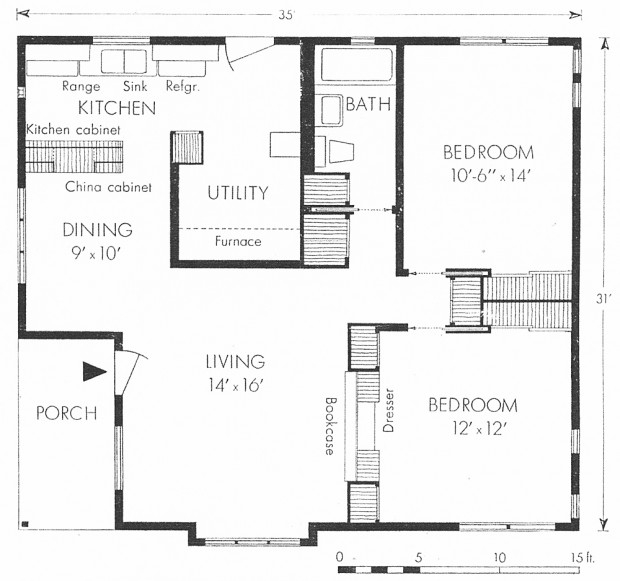 ABOVE: The most popular model, the two-bedroom Esquire. ABOVE: Whoee! A Esquire Lustron in Emporia. The only Lustron in Emporia. And it can be yours for $49,000. ABOVE: The Emporia Lustron is in remarkable condition. 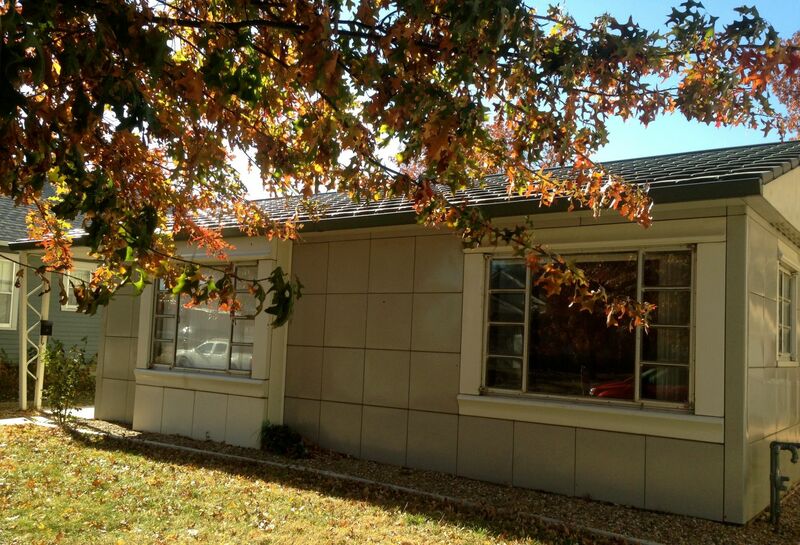 Often such houses suffer from rusting steel panels, replacement windows, and replacement siding. Oh the horror! 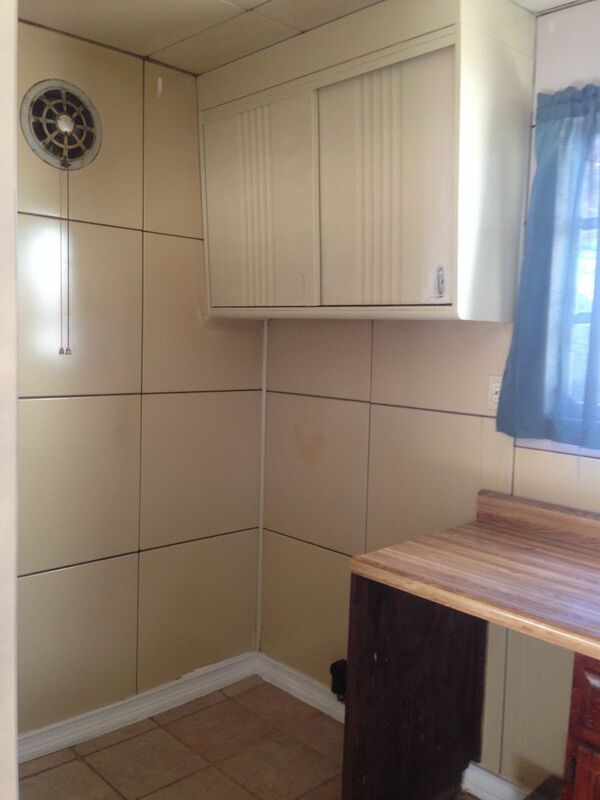 This Lustron is in great, original condition. I even like the colors (green roof, gray walls with a green hue, and cream accents also with a green hue). ABOVE: The aluminum windows are WAY cool. They are in excellent condition save the rubberized gaskets holding the glass in place. I would replace these with standard glazing compound. 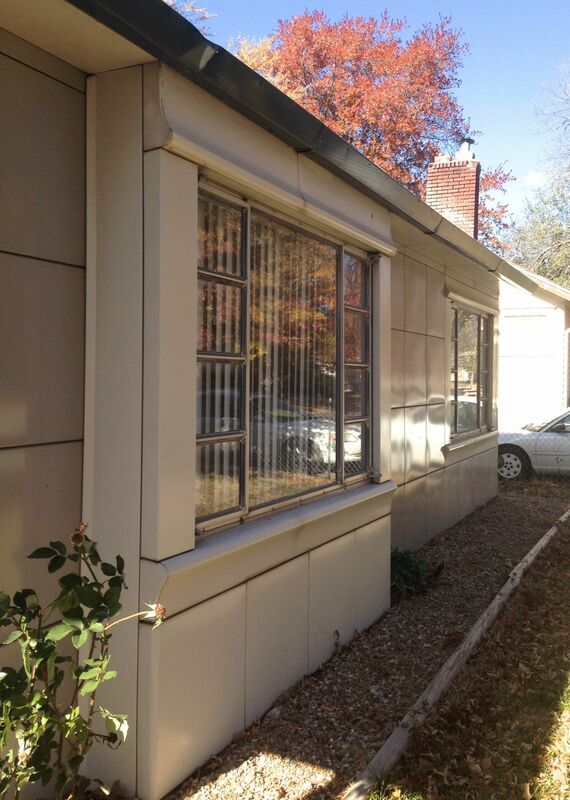 ABOVE: You can see how replacement windows SO do not look right on a Lustron! ABOVE: The Emporia living room. 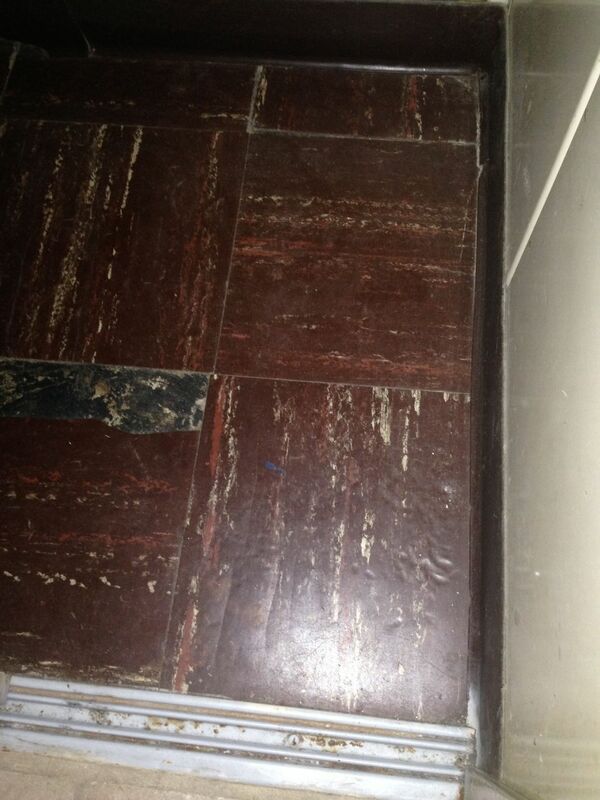 The most serious issue with this Lustron is how the floor slab has settled in this area. This has caused the steel wall panels to “step” along the top, as evidenced in this image. Some people could live with this; I could not, and would have to rectify the situation, damn the expense! 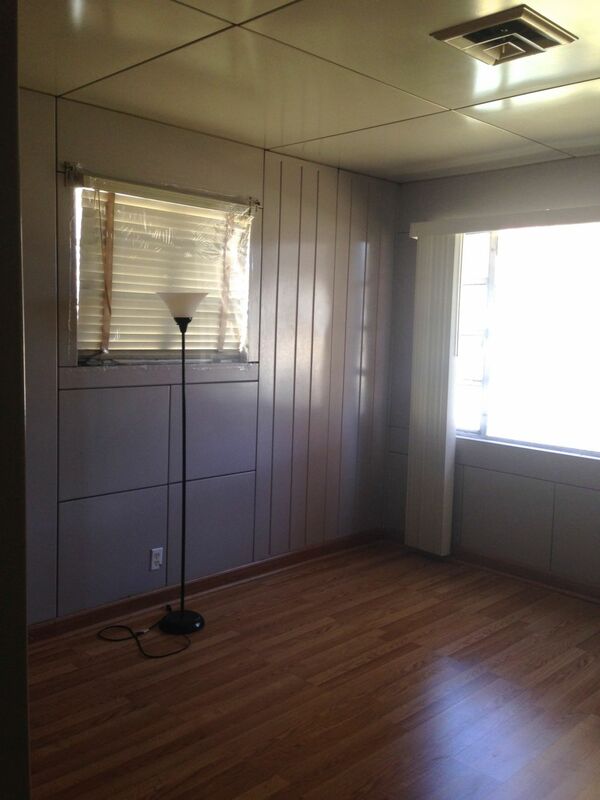 NOTE: The flooring is not original, nor the base molding, or ceiling vent. ABOVE: In the linen closet is the original flooring. I would work really hard to find matching tiles to recreate the original flooring. ABOVE: Looking towards the dining area. The cabinet divides the room from the kitchen. Note the pass-through. Convenient! This is one of the things I love about Lustrons: they were incredibly well thought out. ABOVE: The kitchen. 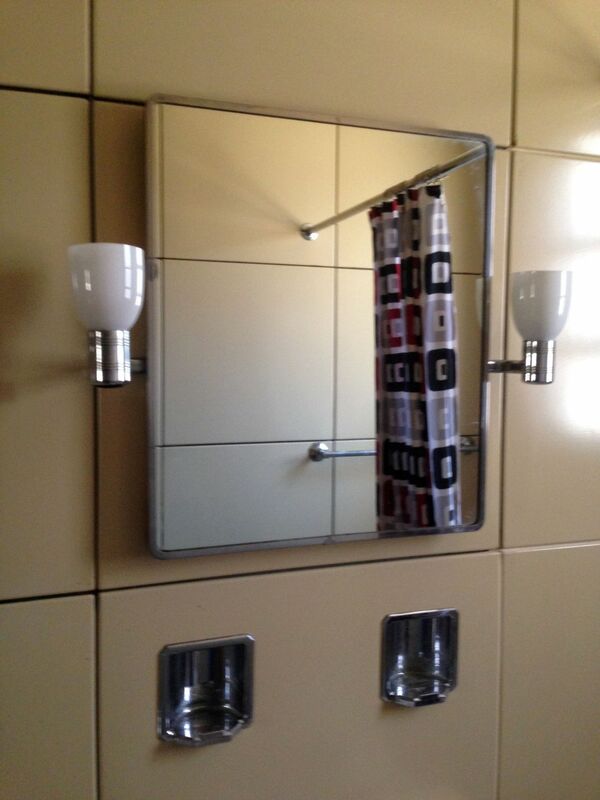 Save the sink cabinet, the other cabinets are original. So is the ceiling light (missing its shade) and wall fan. Love these touches! ABOVE: The divider between kitchen/dining. The sliding panels on the lower cabinet are in the outbuilding (behind the house). ABOVE: The stove goes here. ABOVE: The utility room. 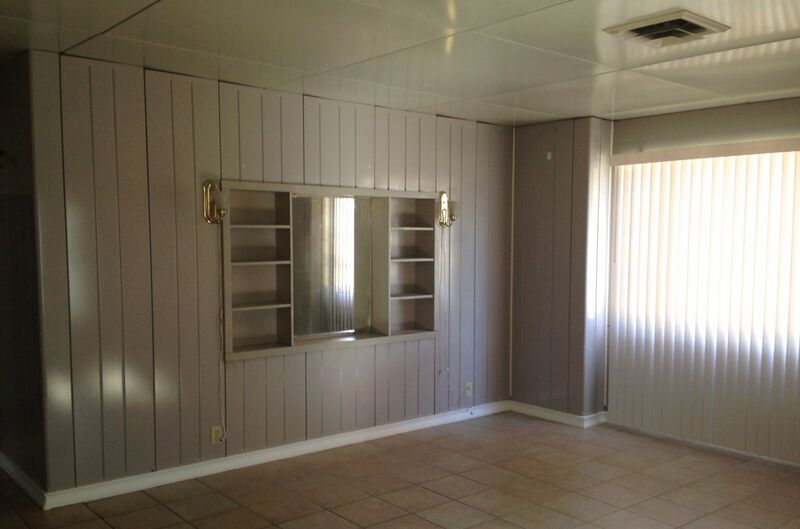 This rather spacious room houses the furnace, hot water heater, pantry, and washing machine. 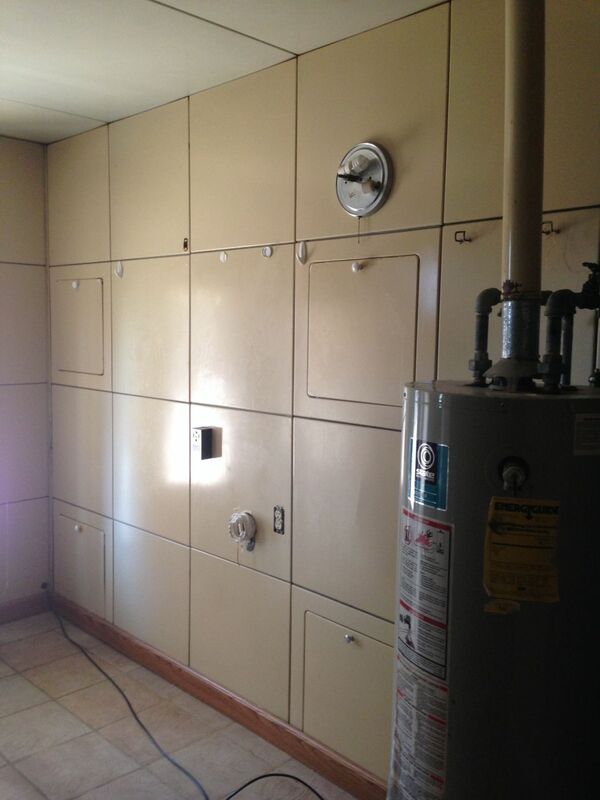 The panels open to reveal plumbing (the bathroom is on the other side of the wall) and telephone connections. Cool. ABOVE: The master bedroom with built-ins galore! The three-part mirror over the make-up table is missing, exposing the steel panels of the living room. This is the wall which has settling issues, which means that the sliding doors do not slide. But at least they are still in place. ABOVE: More master bedroom. The sliding door (which works well) to the left goes to the hall. I do not know what is wrong with the finish of the closet sliders. Lustron owners take such issues to body shops to refinish. ABOVE: More master bedroom. This is the only wall to place a bed. ABOVE: The smaller bedroom. 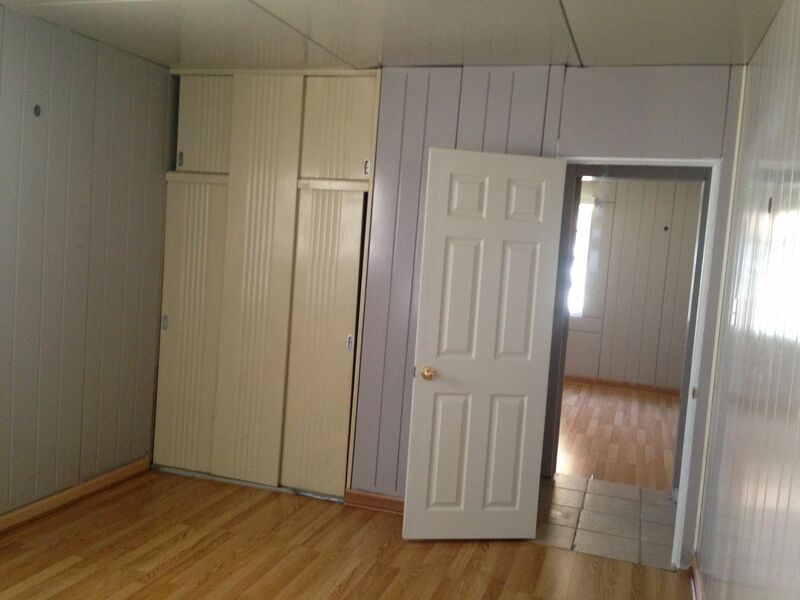 The door to the right is, obviously, new. I would love to know if the slider is still in the wall! ABOVE: The bathroom. And what a wonder it be! 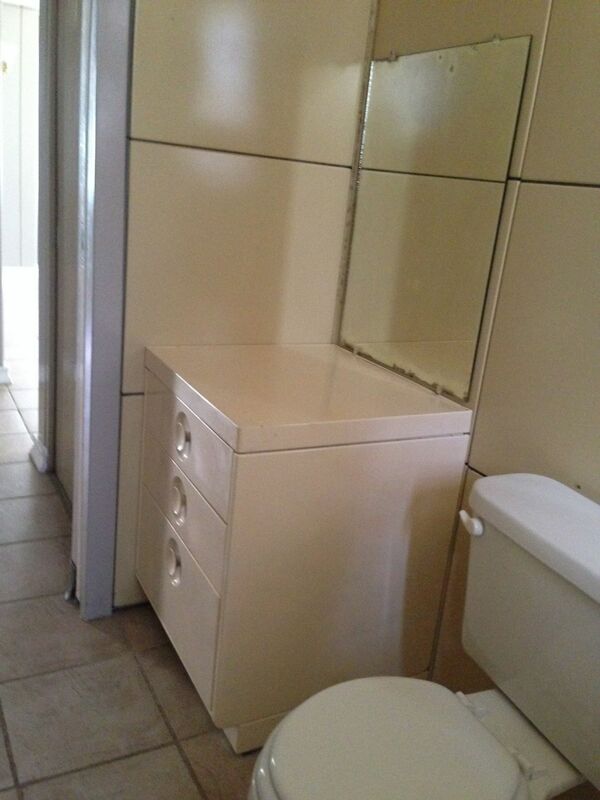 This is the most original Lustron bathroom I have ever seen. Save the flooring and toilet, pretty much all is as it was. Nice! Many Lustrons have serious corrosion where the steel panels touch the tub but not here. Wonderful! Whoee! ABOVE: Whoee! Even the glass shades are original! ABOVE: The back of the house. Not bad looking! I would relocate the meter, all the wiring, and the AC condenser. And I would remove the awning. 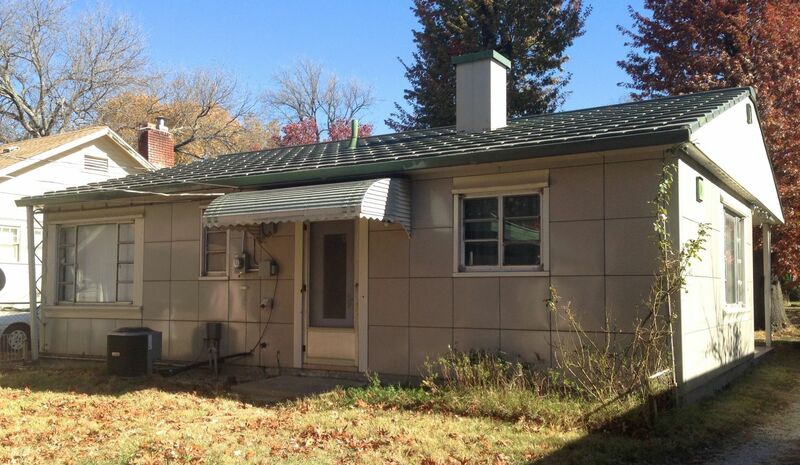 The decorative oh-so-50s detail on the far left is actually the downspout for the gutter. ABOVE: Just behind the house is this way cool 1950s party pad, and with a room behind. The room has electricity but no plumbing or HVAC. It would make a great shop, office, or guest bedroom once HVAC was installed. Somebody went to great effort with this structure as the walls look like Lustron panels but are actually concrete. I would carefully restore this fabulous structure. 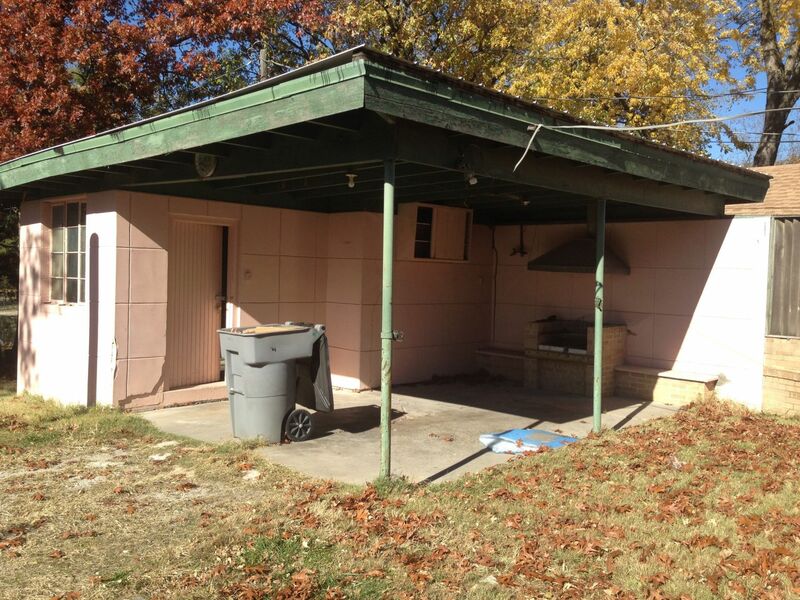 There is also a 2-car carport, and the lot, unexpectedly, extends WAY past the carport. Lustrons had an extremely odd but fascinating heating system. For those mechanically-minded, you will greatly enjoy this page. I have lusted after this Lustron for many years and have patiently waited for it to become available. Had this happened a year ago, before I purchased the Cross House, I would have snapped it up! And I would have largely dismantled it to restore it, well, right. 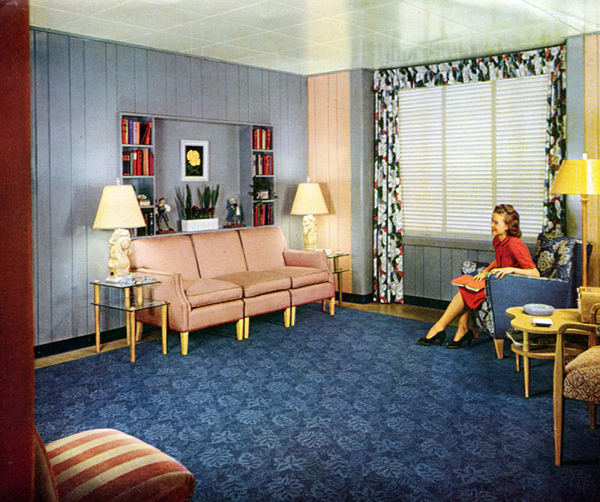 Then I would have had immense fun carefully recreating a distinct circa-1950 period decor — not Deco nor Atomic-age but that wonderful in-between aesthetic which has no name. Today, with the demands of the Cross House, there is no way I could take on such a project. Sigh. But maybe, maybe, some crazy nut (with money!) 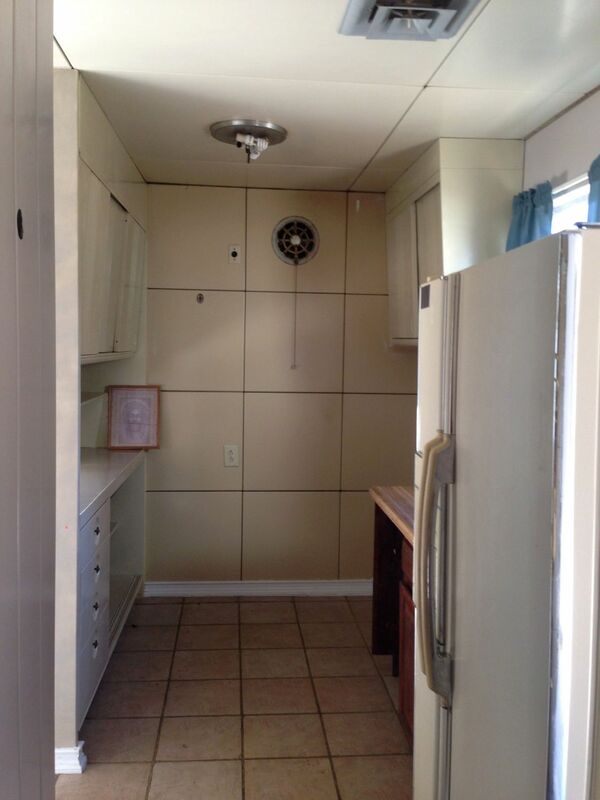 will come along and realize my hope for this Lustron. I cannot imagine how in, say, 1980 one would have been able to properly restore a Lustron. Today, there is a wealth of information available, notably at Lustron Preservation. And restoring a Lustron is also MUCH easier by having the original erection manuals easily on hand, here. There are books, too, and even a movie. On Old House Dreams, here. 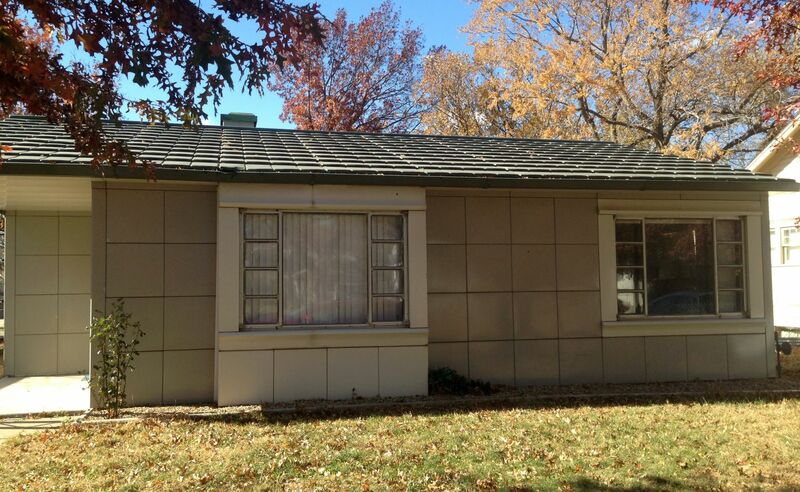 26 Responses to A Lustron In Emporia! Wow! 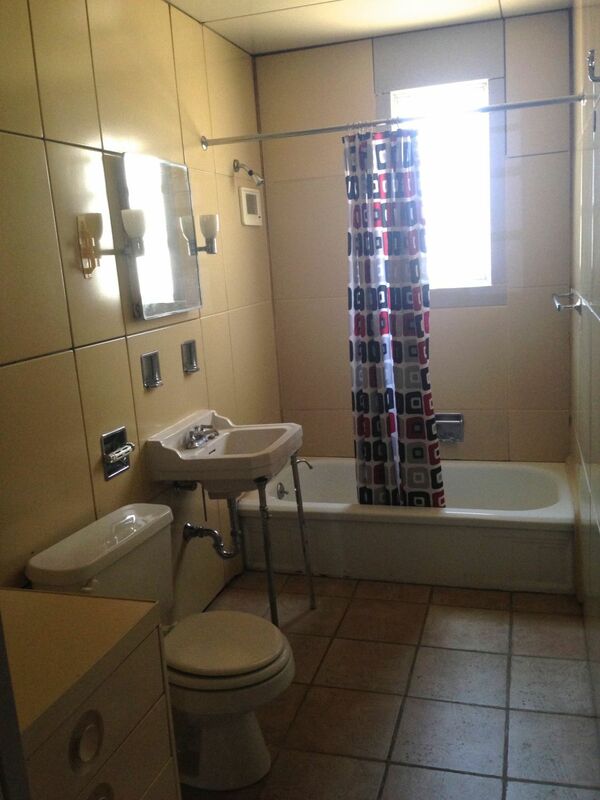 I don’t think I’ve ever seen the original fixtures, tub and toilet in a Lustron like this before! I really like these houses. In 1948 $8500 is equivalent to $83,952 accounting for inflation. Not bad for an all steel home! Original floor tiles would be rather hard to salvage. 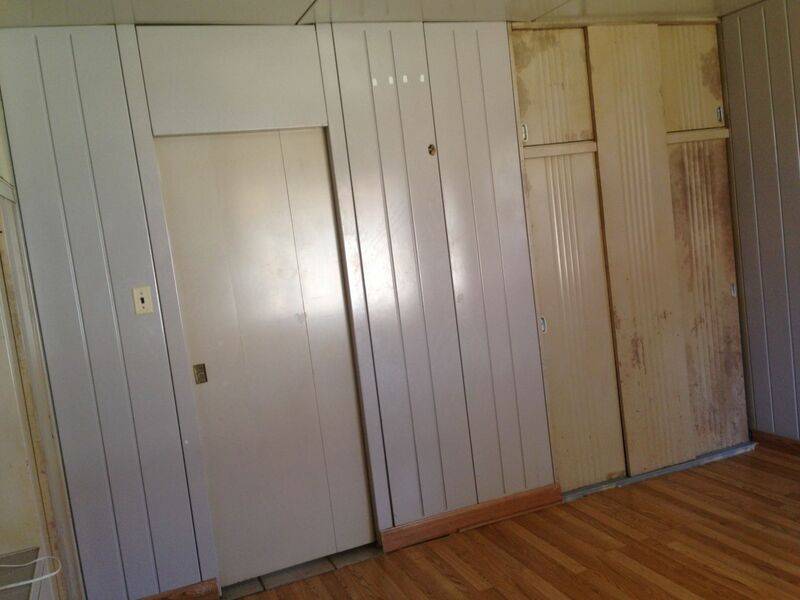 Our 1960s national prefab home has them in an addition and, even if you found a place that has them, they very rarely come off the floor in one piece for historic salvage. I think most of those homes had no floors other than the Westchester Deluxe, so rather than worrying too much, I would find something that looked right for the era, like some 12×12 stick-down tiles. As long as they look from the era (the ones we have are reddish brown), they would look at home. I agree that the old floor tiles cannot be salvaged and reused. The original are like 10×10, and replacing them with 12×12 tiles (the size common today) looks, IMO, a little off, as the scale is changed. I would find find tiles that came as close as possible to the originals in terms of color and design, and have them all re-cut to 10×10. I know, a little nutty, but nutty I be! I measured the floor tiles we have, and they are 9×9 inches in size. There are some ceramic tiles made this size that might work as a vintage-looking replacement but it seems that if you want a bit less expensive option, you might try the 8×8 size as these cost 1/2 as much and actually seem to come in more colors that well, and fit the design of that house a lot better. There is a Lustron a 10 minute drive from me and I am rather surprised it is still standing, given the amount of new homes built around here. Supposedly, some areas have way more Lustrons. People know they are historical, but when the grandparents pass, they also know the property under them has more value than the home, and, let’s face it, if they could not give away like fifty-seven of these on the military base, how is one going to be fair…(cue photo of scrapyard)? I love living in our Lustron Home in Michigan, and I really appreciate the info and pictures here! We have to deal with a leaky roof and if anyone can help with possible solutions, we would really appreciate it. The roof panels have rusted through the bottom of them-We are just now searching for a sealer, etc. to stop the leaks. We can only see the damage when we’re in the small attic area. I don’t want to put a new roof over it-but is the historical value more important than the reality of a rusty, old roof? Thank you for any comments or suggestions-have a great day! We have some stuff at the local hardware store here that is a epoxy that dries clear, but its rather expensive at 90 dollars per 2 gallons. Might try that on the top of the roof in the joints and as it’s a clear drying product, it will show but less so than a replacement roof would. The only fear I have is would it stick to the glasslike paint; might need a scotchbrite pad to roughen it so it can hold. I would let the stuff drip through and if you can get behind it, put some masking tape anywhere light comes through, and it will hold the stuff into place until dry. I’ve never seen or heard of a Lustron before. They probably only sold in a limited service area in the midwest. It’s definitely an aesthetic all it’s own. Kinda upscale pre-fab. Definitely post-war machine-age. I have a mild aversion to it and could never live in one. High gloss, flat steel panels set in a rigid grid, gah! Cold! Stiff! But also looks flimsy. Probably noisy too. It’s just not architectural enough for me. I love shiny painted metal when it’s formed into voluptuous curves. Without curves, I don’t. And I really want wood and textures and patterns other than squares too. Buckminister Fuller had a similar (but far more exotic) idea with his Dymaxion house. He too, wanted to put post-war factories to work building houses. The Dymaxion was never produced, except for two prototypes, one interior and one exterior. 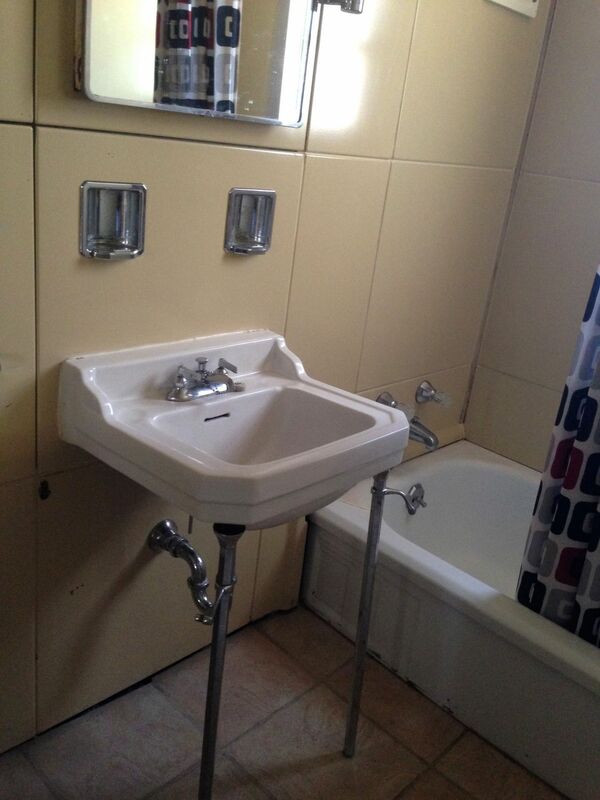 However, wikipedia claims a plastic version of the bathroom was available intermittently until the 1980s. Same era, completely different vibe. More UFO than cookie cutter house. Wikipedia also mentions the Futuro, a pre-fab vacation home designed by Matti Suuronen, a Finnish artist, and produced in low volume until 1973 when the oil embargo caused the price of plastic to skyrocket. It’s even more like living in a flying saucer than the Dymaxion is. Here’s a quick tour. Very fun! I’d love to spend a vacation in one. I feel very sorry the person passed but wonder how this place held up on the inside….its never good to have death in the report on one of these homes but it looks like you could literally still hose the thing off and put some new wiring and it’s ready to go, but likely would get torn down is my guess. I list two in Emporia, Kansas. Commerce Street and 617 Lincoln. Is this a third Lustron? Can you report the serial number which is on back wall of Utility room. I can see that this is an 02 GRAY. What is the other one? Both the 02 and 03 standard designs were “Westchester” models. The Esquire was built in South Hinsdale,IL as a demonstrator and differs in several details. It is gone now. The Lustron is this post is at 617 Lincoln. There is no Commerce Street in Emporia. 617 is the only Lustron I know of in Emporia. I loved your post. I just bought a Lustron in Saint Louis. I’ve been nuts about them for years and have decided to become a Lustron hoarder. This is my first of at least 10 before I’m dead. I just put one under contract in St. Louis. Where about is yours? A tree fell on our roof so we had to replace the front part of the roof on our Lustron Home. We have lived in it for 30 years and have never had any problems and really like the house. We live at 10 Holmes Place in Fredonia NY. We have several roof panels that were not damaged and we’re wondering if anyone knows someone who would like to purchase them. I would hate to scrap them if someone is looking for them. We could not find any to use on the damaged portion of the roof so had to replace it. Really do not like the look of the new steel roof but had no choice. If anyone knows if there is a market for replacement parts, please let me know. I also have a bathroom door. Jerry, Jerry, Jerry….you have a bathroom door? We have a Lustron home (1 of 2) in Dowagiac MI, and the door rollers on the bathroom door have failed for the last time. We really just need a couple of rollers, but I suppose we could consider taking the whole door. Where are you located? I just bought a Lustron and noticed some heavily rusted roof panels. Any chance you still have those? anyone needing roof panels? seems someone on ebay(as of 04/10/2017) has what looks to be a whole roof of them? Not sure I understand what you need, Keith. Are you referring to a “locking” mechanism that secures the door closed? 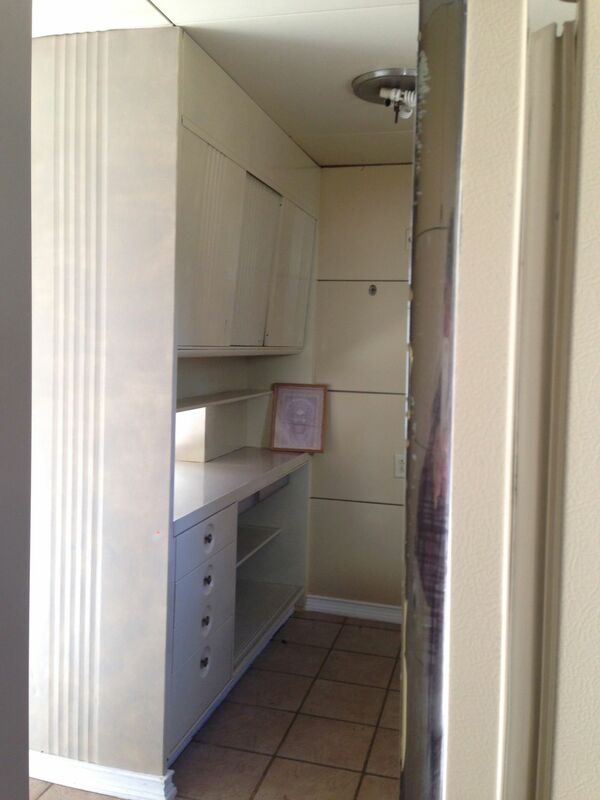 I recently purchased a a couple of Lustron homes and wondering if there is a manual on how to take the panels apart? Any help would be greatly appreciated. How’s this? Will this help? It’s a whole book about “deconstructing” a Lustron. Good luck! We have one, too. We use it as a rental. Only two in our town in SW Michigan. There is an old gas station, now used as a used car dealership in our town. Did this company make garages? 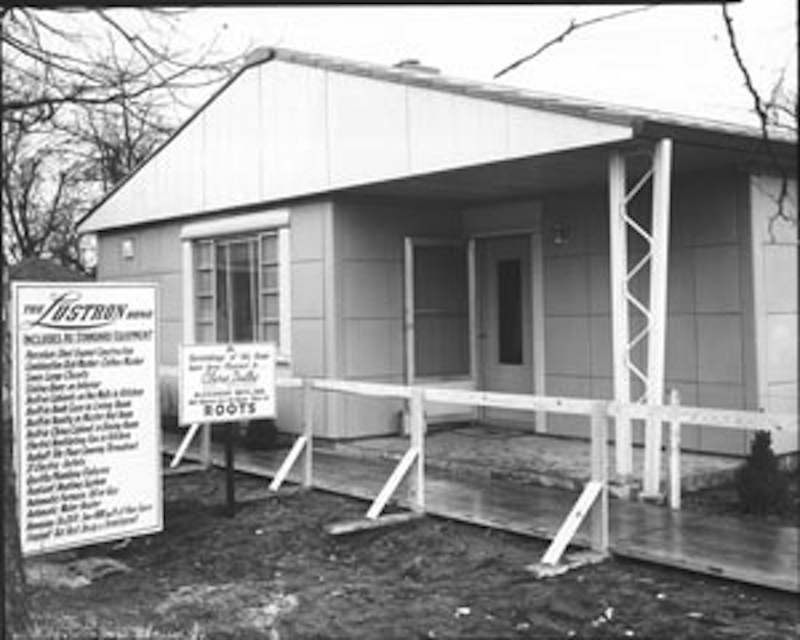 Lustron did not build garages, but the parent company, Chicago Vitreous Enamel located in Cicero, IL (just west of Chicago) supplied architectural frames, tiles and so on for hundreds of gas stations, White Castle stands, Architectural panels for stores in town and so on. They spun off Lustron as it was Government funded. American Oil, Texaco, Esso, and other BIG oil companies used the Chicago Vit buildings. 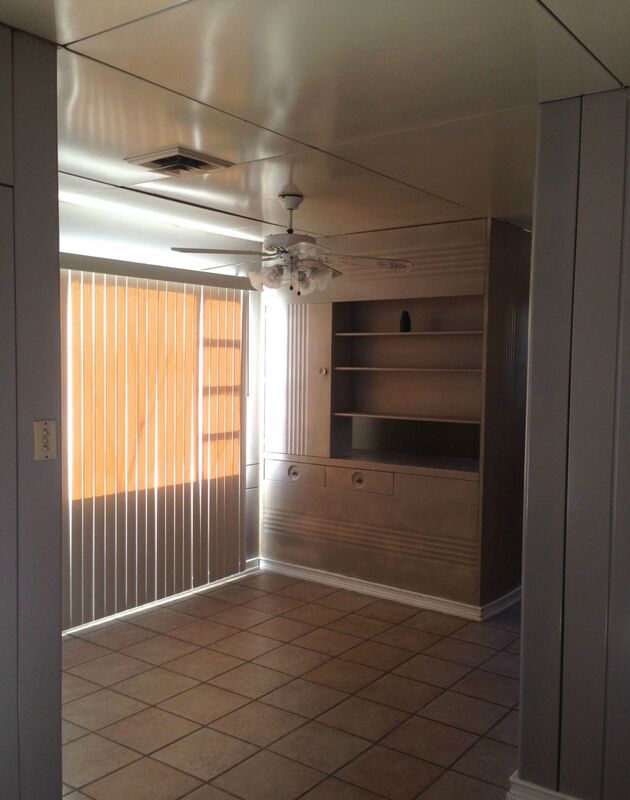 Does anyone have any experience rewiring a Lustron house in order to accommodate modern electrical devices including ACs and modern kitchen devices? Any suggestions on presumably ductless ACs that would fit the Lustron system without destroying the heating system? Can one climb up into the attic through the utility room door and install wiring without damaging the ceilings? I would recommend to take this to the two Facebook groups. You’ll get immediate responses.